She walks in beauty like the night….and will damn well put out the fire raging at your house. This is my beautiful cousin Gretchen whom is an EMT and firefighter in Lafayette, IN. 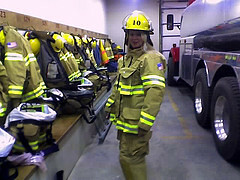 Wife, mother, daughter, friend, FIREFIGHTER….she wears all the hats well. And let me tell you, Indiana, still not a progressive state when it comes to women…way to go Gretchen.